Were you looking for a kitchen post today? I know you’ve probably come to expect it. I finished the series on Friday, so the next time you see something kitchen-related, it will be a small project, or better yet, a recipe! 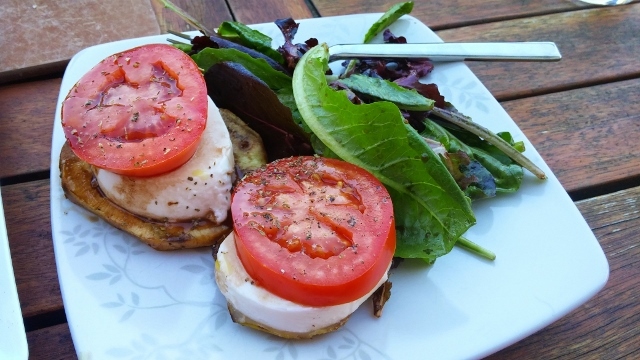 I didn’t make eggplant caprese in my kitchen (though you could). Instead, we made it outside on our grill – perfect for the coming summer! I started by removing the skin from the eggplant. You don’t have to do this step, but it takes away some of the bitterness in the eggplant. A veggie peeler didn’t work well for me, so I went ahead and just cut off the skin. Then, cut the eggplant into rounds about 1/2 and inch thick. You can make them thicker, but keep them as uniform in size as possible so they will cook evenly. Next, weep the eggplant by sprinkling a good amount of salt over each slice. Let sit for 10 minutes. I always wipe the eggplant with a paper towel, pushing down a bit as I do, to get as much moisture out as I can. Flip the eggplant over and do the same thing on the other side. Now, it’s grilling time! Dan usually starts grilling while I finish up the rest of the chopping. Generously brush the eggplant slice with olive oil, then place of the grill. Try not to move the slices around too much, so you’ll get great grill marks. 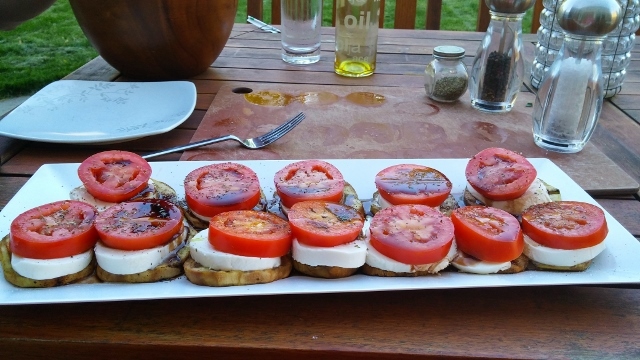 While Dan grills, I’m cutting the tomatoes and mozzarella log into even slices. Cook the eggplant slices about 4-5 minutes, then flip and cook for another 4-5 minutes. When the eggplant is done, place them on a plate, but don’t stack them. Top each slice with one round of cheese and one piece of tomato. To finish, sprinkle with the Italian seasoning (basil is better if you have it, but I didn’t), salt, pepper, and balsamic vinegar. I served the eggplant caprese with a small side salad of arugula greens with green onions and just a bit of balsamic vinegar dressing. This was a healthy, easy (and tasty) meal. I know we’ll be enjoying this dinner many more times throughout the summer.